Whether you have a website to support your business, whether the website IS your business, or whether your website is only a hobby to update your friends and family, Blogs by Heather is a resource you need to know about. Creating and then maintaining a blog or website can be very time consuming. I’m always looking for ways to reduce the amount of time I spend on the tech components so I can concentrate on reviews and content, but it’s difficult! There are a range of blog maintenance services that Blogs by Heather offers. If you are looking for someone to handle everything for you, you can hire Heather. If you want to do things yourself but need tutorials and occasional help, subscribe to her newsletter. Right now, she has a current post with Questions and Answers – here’s a sample of the questions. How do you track clicks on a page? How to embed a YouTube video into a blog post? There are more – I could spend hours on her site! Have you been thinking about starting a newsletter? Newsletters are key tools for Direct Sales consultants, but are becoming more and more popular with bloggers as well. Blogs by Heather has a Newsletter Design Service and she will walk you through creating your own newsletter template design. If you want a newsletter banner that is different than your blog header, that design service is also available. Blogs by Heather is a sponsor of the upcoming Build A Beautiful Blog Week, hosted here at Kelly’s Lucky You and at Simply Stacie. As a sponsor for this great event, she is giving away THREE gifts! Please visit Blogs by Heather and see what there is available! Come back on Monday, 5/23, to enter to win and all through the week! Thank you very much Stacie!!!!! Happy to help any time! Thank you and Kelly for running such a great event and welcoming me to it – Build a Beautiful Blog Week. I am excited and can not wait to read every post – AND try things out. 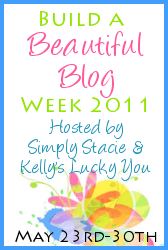 And I’m looking forward to this “Build a Beautiful Blog Week”, great idea. I’m definitely going to enter this giveaway! !